It was a tough decision which Spirited Dinner to go to this year — so many menus looked great, we were teetering between Wolfe’s in the Warehouse and Iris and we thought long and hard about trying someplace new to us — but in the end it was kind of a shoo-in. 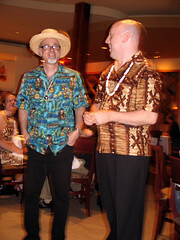 Jeff “Beachbum” Berry was mixing for another dinner this year, and last year he and Wayne Curtis made fantastic drinks to accompany Chef Chris DeBarr’s “Modern Tiki Cuisine” for one of the best meals I’d ever had … well, as much of it as I remember. Bum and Wayne’s drinks contained a total of 7-1/2 ounces of rum during that three-hour meal, and it didn’t help that earlier in the day I’d had tastes of six Scotches, ten gins, eight brandies plus the Cocktail Hour event (inexplicably and invariably scheduled right before the Spirited Dinners). 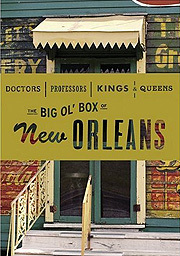 Once I finally decided that I wanted the Bum’s drink pairings again, especially since this year he teamed up with Martin Cate, formerly of Forbidden Island and soon to be proprietor of Smuggler’s Cove in San Francisco, I knew some preparation was in order. I decided I’d better take it easy during this year’s Tales Thursday so that this meal wouldn’t completely liquefy me — no taking three seminars in a row that involve copious amounts of spirits tasting in which Chuck fails to make use of the spit buckets. Rick, giving friend that he is, helped out by adding an additional rule to his previous list of ten: “Chuck is not allowed to drink before the Spirited Dinner.” Despite that, I did manage to make it to the Cocktail Hour event, which 1) should be in the Presbytere every year, as it was a beautiful location for the event, and 2) should never again be scheduled before the Spirited Dinners unless they’re willing to provide buckets for us to be poured into. Fortunately the gods were looking out for me at Cocktail Hour by causing my favorite bartenders to all run out of cups by the time I got to them. 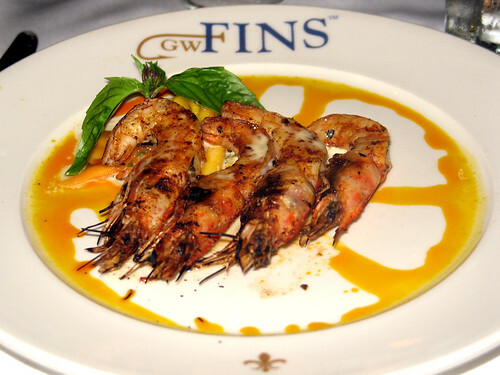 A short walk from the Presbytere took us to GW Fins, one of the city’s newer restaurants (i.e., opened during the 21st Century rather than the 19th or early 20th) and a renowned destination for seafood. Theirs was one of the two or three most exciting looking menus on the Tales site, plus we knew a ton of people who were going to this one too, all elements for a great evening. Wes and I sat with several of our friends from Seattle and Portland, and we toasted each other with the welcoming cocktail, first of six for the evening. 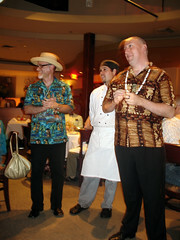 Finally, after we had settled in and begun enjoying our aperitivo, our intrepid mixologists, Beachbum Berry and Martin Cate, arrived (along with GW Fins’ chef de cuisine) to welcome us and talk a little bit about what was to come, and how quickly their ideas for perfect cocktail pairings came to them as soon as they saw the proposed menu. 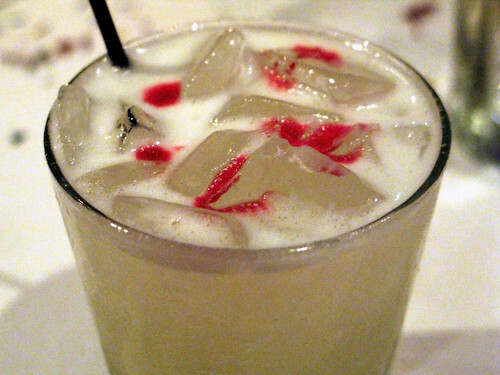 Some will argue that cocktail pairings are even better than wine pairings, as you can tailor the drink to the food very precisely. Whether you believe that or not, I’ll say that this particular meal featured some of the best food-beverage pairings I’ve ever had. And now … dinner is served! 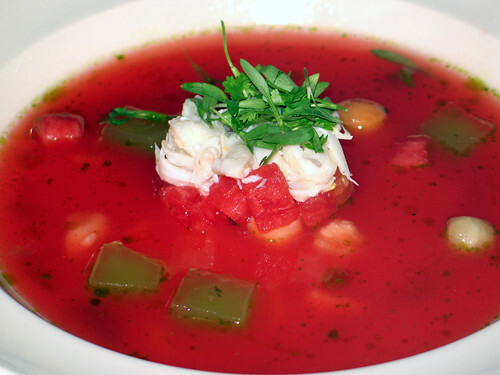 We started with a Chilled Melon Soup, in the center of which was a huge scoop of jumbo lump crabmeat topped with cilantro sprouts. Mixed into the soup were little balls of watermelon plus cantaloupe and honeydew melons, plus cubes of lime gelée, which provided a delightful little burst of tartness and change of texture every few bites or so. The soup was bright, cool, refreshing and delicious — the lightness of the dish was welcome to those of us who’d been having hollandaise-napped egg dishes for breakfast or huge piles of fried seafood for lunch. And, oh my Gawd, that crabmeat … I’ll eat pretty much anything that has a scoop of jumbo lump crabmeat in the middle. Quick on the heels of this great opening to the meal was our second (well, technically our third, but second course) cocktail, Captain Vadrna’s Grog — Old New Orleans Cajun Spiced Rum, lime and grapefruit juices and demerara syrup. 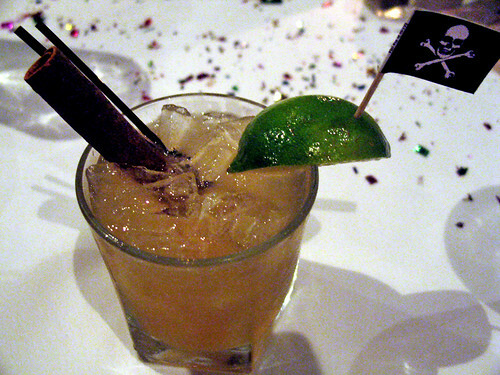 Nice big aromatic cinnamon stick as garnish, and … a pirate flag! Almost immediately, my friend Rocky and I broke into a chorus of “Yo Ho, Yo Ho, A Pirate’s Life For Me” (assisted by some quick Googling on Rocky’s phone, as we both ran out of lyrics after the first verse). Pretty quickly a fair swath of the restaruant was singing along, undoubtedly to the bewilderment of the guests who were there for the restaurant’s regular menu and not for the Spirited Dinner. Word trickled back from the bar that once Bum and Martin heard that they said they knew the party had finally started … either that or had already gotten out of hand, I forget which. 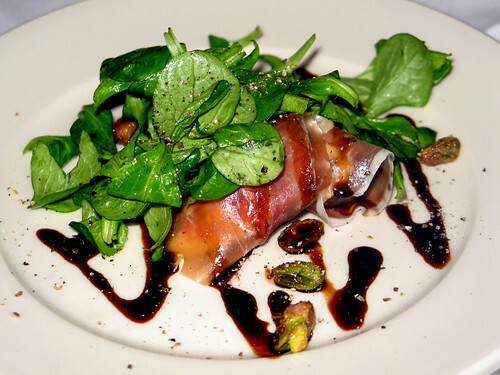 Before we got too far ahead of ourselves, the 2nd course arrived: Prosciutto-Wrapped Figs with mâche, cinnamon mascarpone and candied pistachios. I’d almost eat this as a dessert — fruit stuffed with spiced cheese and wrapped in pig. It’s many of my favorite things, on a plate! Oh, and greens to make it officially salady, but … the sweetness and nuttiness of the mche went beautifully with the spiced rum in that cocktail. So did the cinnamon-spiced mascarpone, which caught the cinnamon and nutmeg notes of the rum. The lettuce was gorgeous with the pistachios too, and the candied crunch of the nuts was balanced by the tart citrus juices. Salads are notoriously difficult to pair with wines, but this one, even with its balsamic drizzle, was superb with this drink, and the drink was superb with the dish. Third cocktail! Oh my, this is a big one. Served in a pilsner glass — we’re not messing around. 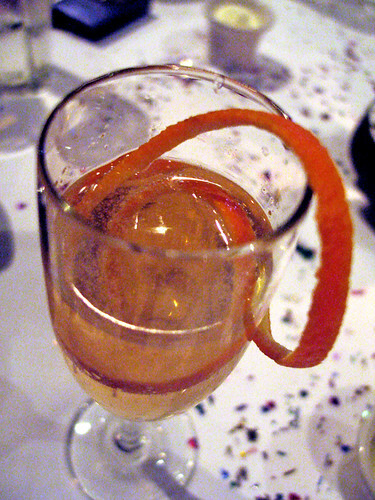 This was the Hedgehog’s Dilemma — caramelized mango, lemon juice, Noilly Prat dry vermouth, passion fruit syrup, Myers’s Platinum rum and Angostura bitters. 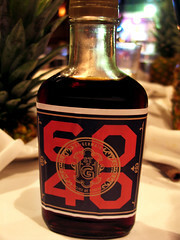 A fantastic drink, and on its own I’d be more than happy to order it again from any tiki bar’s menu. Four pretty huge shrimp were both quite enough, considering we’d be having five courses, yet left me wanting more. Then entire pineapples were brought to the table. It was our next drink! 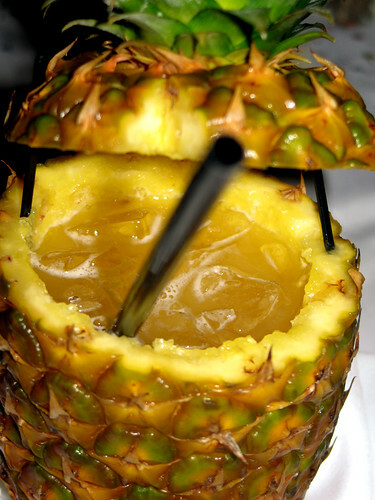 Applause and giggles greeted this one, as the pineapples had straws sticking out of them … we lifted the lid to find the whole fruit filled with a beverage, man! 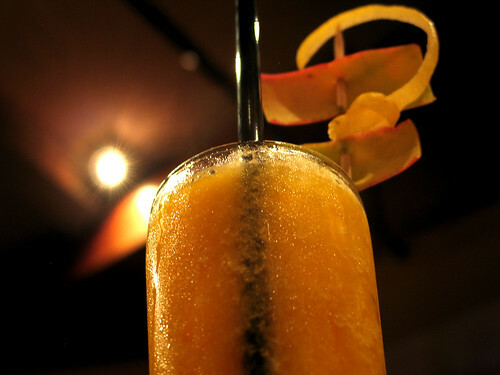 This was the Miehana — pineapple, orange and lime juices, Cruzan Estate dark rum, Cruzan Coconut Rum and Grand Marnier. Also very refreshing, and not as sweet as you’d think it might be. 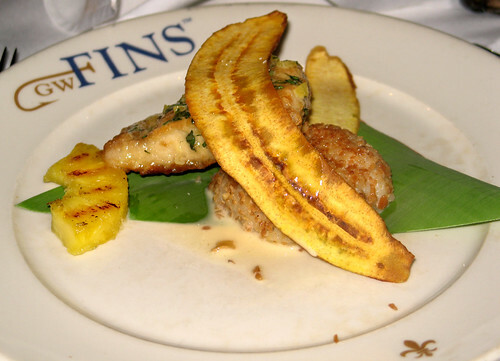 Our 4th course was Pineapple Basil Glazed Mahimahi, with coconut-cashew rice, crispy plantains and lemongrass butter. This is the kind of dish people wished they could have gotten in the “Polynesian” restaurants in the 1950s and ’60s, because it epitomizes what that cuisine aspired to but rarely attained. Gorgeous tropical flavors, a perfectly grilled piece of fish, and all of the flavors of the dish and the cocktail working in harmony with each other. This dish actually made us all laugh — that’s how delightful it was. And lest you think it was overly sweet, it wasn’t. The acids in the cocktail helped cut through the sugars, the richness of the lemongrass beurre blanc added richness to balance the acids and sugars, the plantains added texture and starch and were decidedly not sweet but the flavors complemented everything else. 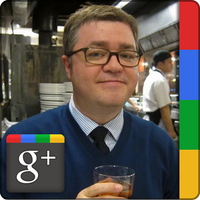 That drink with this course is one of the best food-drink pairings I’ve ever had. Fun fun fun. 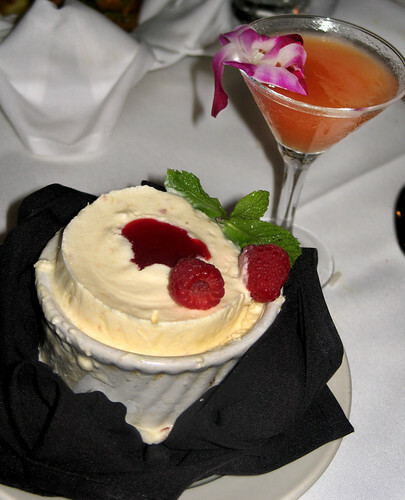 Our dessert was a Frozen Peach Soufflé, with a raspberry coulis and a few fresh raspberries. Simple, delicious and summery, and entirely appropriate given that it was roasting outside. The rum, with hints of chocolate plus more raspberry, were just the thing to have with this dessert. 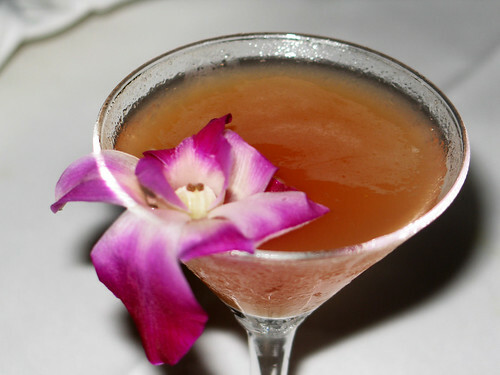 It’s such a pleasure to have a dessert cocktail that’s not filled with heavy cream or with enough liqueurs to make it as sweet as a candy bar. We had a fantastic time, fantastic food, fantastic drinks (and Rocky realized that the Miehana came in the ultimate go-cup), but it wasn’t quite over yet. There were lovely parting gifts!